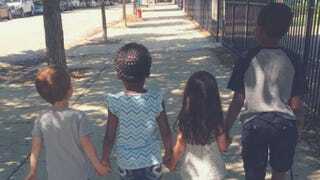 Two West Town, Chicago, moms are taking a stand after receiving a racist anonymous letter that targeted their black nanny. According to DNAinfo, the moms and the nanny have fired back with their own letter supporting a message of love and are also encouraging others in the community to come out for a Stand Up to Hate Play Date. First Ward Alderman Joe Moreno has gotten involved in the cause and said that he plans to attend the playdate, set for 5 p.m. Thursday. Moreno, who has seen what he calls the “repulsive” anonymous letter, said that it was filled with racial slurs calling the nanny the n-word. The author of the anonymous letter signed it as “Concerns [sic] Ukrainian Village Moms” (I’m sure they are) and wrote that it was “amusing” that the nanny’s employers are “trying to rebel against the greatest leader this country has ever seen” by hiring black. “Honestly, you need to fire her because otherwise it looks like she is your modern-day mammy. Please take heed to the advice being shared in this letter, find a new nanny. We do not need an infestation in our community,” the offensive, racist letter reads. The unsigned, unstamped note was put in the mailbox of Heather DeJonker’s home on Oct. 16, filling her and the others with dread but also determination. “It was very upsetting to all of us, and while we were deeply hurt, we also knew that silence was not an option. We had to take action,” DeJonker and Maria Ippolito explained in the event description on the playdate’s Facebook page. “We were all absolutely sickened by this, but luckily most of the community has rallied around us and our babysitter. As a group, we decided that we need to do more,” they added. The duo took the letter to the police and contacted their alderman before installing security cameras. The police confirmed that they are aware of the incident but said that they are not treating it as a hate crime because no threat was made. The targeted nanny, Ferrai Pickett, has a degree in early-childhood education and plans to teach preschool or kindergarten eventually. However, she began watching DeJonker’s now-5-year-old daughter back in August 2014. In January 2015, Pickett began watching Ippolito’s son, who is now 4, and just last year she began helping out with the newest addition to Ippolito’s family. According to DNAinfo, sometimes Pickett brings her 9-year-old nephew and 6-year-old niece to the job, and all the kids have a blast playing with one another. “We felt so lucky that our children could spend so much time together, especially in the summer, when everyone is off from school. They call themselves the ‘Kids Club,’ and the love they have for each other is pretty remarkable,” Ippolito said. That is, until ugliness came knocking at the door. DeJonker’s mother, who was visiting at the time, was the first to see the letter. “She was horrified. She called me at work and told me about it. When I read the letter, it felt like a punch in the stomach. I was nauseous, and I was praying to God that Ferrai didn’t have to see it,” DeJonker said. Pickett never saw the letter but said that when she first heard about it, she considered quitting. “These precious faces are our future. They are my babies, and I will show them how strong I am. I will show them how to unify and celebrate each other’s differences,” Pickett told the news site. “We knew that we could not remain silent or else it would seem like we were agreeing with this person or that we were afraid to speak up. We are all in the field of education and decided to use this as a teachable moment for our kids,” Ippolito said.